MAY 24, 2000 – FORT ERIE, ONTARIO: Delays by Vatican officials have prompted the Fatima Center to renew its call for release of the original text of the “Third Secret” of Fatima. 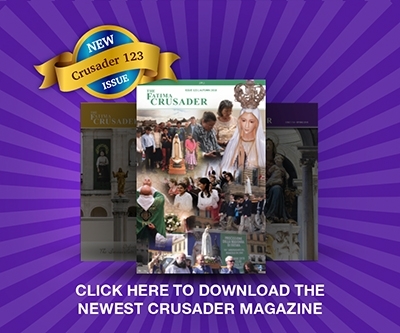 The Fatima Center is a major Catholic organization that promotes the Message of Fatima, and publishes a quarterly magazine, The Fatima Crusader. “We hope and pray that the Holy Father’s order will be followed strictly by publishing the original document in its entirety,” said Father Nicholas Gruner, who heads the Fort Erie-based organization. “The only way to end all speculation about the Secret is to publish Sister Lucia’s original handwritten text,” he added. Sister Lucia dos Santos, now 93 and residing in a Portuguese convent, is the only surviving witness to the Fatima apparitions, which occurred in 1917. Her text of the “Third Secret,” written in 1944, was to be published in 1960, but has been withheld by successive Popes ever since that date. The surprise announcement last week that it would finally be released has been followed by a series of delays. After the announcement, Italian newspapers with extensive Vatican contacts reported that it would be published “in a few days”. Later, the same sources reported the release date would be “by the end of May”. Now, the Rome newspaper La Repubblica has quoted high ranking Cardinal Josef Ratzinger as postponing the publication to the middle of June, in order to allow more time for the preparation of an official commentary. “Prompt release of a photographic reproduction of the original manuscript — as was done with the first two parts of the Secret — is the only way to disclose fully what has been repressed and hidden under lock and key for so long,” added Father Kramer.